HomeWTFWTF is happening here?! ?? WTF is happening here?! ?? I was simply attempting to enjoy the game after a long nights work , but it refused to be played . With graphic glitches and for some reason my character moving/sliding without my even touching the controls . I’m .. PISSED . 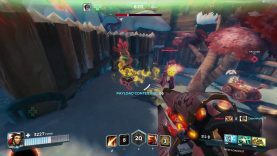 FIX this Hi-Rez !